EDGEWOOD, Ky. -- Overdoses, treatment centers, drug seizures, arrests, needle exchange sites: There's a lot of information to track in Northern Kentucky's heroin epidemic. A "story map" the Northern Kentucky Health Department puts all the data in one place. "The more information to get out -- knowledge is king, as they say, to get the community so they can understand the problem we are seeing," Fort Thomas Lt. Rich Whitford said. For example: The map shows ZIP codes covering the region's major population centers -- Covington, Park Hills, Fort Mitchell, Fort Wright, Newport, Southgate, Wilder, Highland Heights, Cold Spring and Florence -- have had the highest number of opioid-related arrests since 2011. Meanwhile, Petersburg, Burlington, Newport, Southgate, Melbourne and Corinth had the highest numbers of emergency medical runs related to drugs. And the map shows how often during those calls first-responders administered naloxone, which counteracts the effects of an opiate overdose. 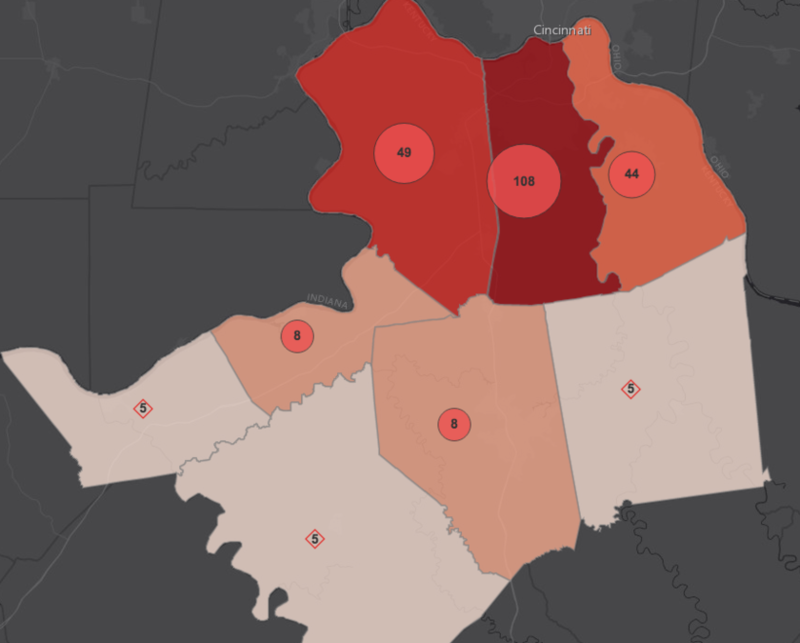 The map shows Kenton County led Northern Kentucky in overdose deaths in 2015. "It's a difficult challenge to be able to track (things like) how is the response going, what's happening in the community, are we making progress, where are issues occurring -- unless you have the data mapped out and in a centralized location. And so we felt like public health was an appropriate place to do this," Health Director Lynne M. Saddler said. One person in Northern Kentucky died from a drug overdose every 40 hours last year -- nearly five times the number of people killed in car crashes. Northern Kentucky’s rate of blood-borne infections -- such as hepatitis B and hepatitis C, commonly resulting from intravenous drug use -- was more than 10 times the U.S. average as of 2014. One in four drug arrests were related to opioids last year, with an average of three arrests per day. Northern Kentucky's fire and emergency medical personnel responded to an average of seven drug-related incidents every day last year; they used naloxone in four out of seven emergency medical runs. The map also shows where people can get naloxone kits and where to drop of unused prescription drugs so children and teens don't abuse them. "You know, anything to save a life is what we want. That's our No. 1 priority," Whitford said. Information in the data story map will be updated every six months. The city of Cincinnati also is tapping into "big data" to battle its heroin epidemic. Data experts are looking at Cincinnati's hot spots to fire personnel can put the right resources in the right places. “The challenge is locating resources where the need is greatest while still providing coverage to the entire city,” Assistant Fire Chief Anson Turley said. Click here to explore the Northern Kentucky Health Department's map yourself.